Do you also plan to support other object types such as sectors, glows, mirrors etc. at some point? Unfortunately no, neck bone controls whole head. Face expressions are made using morphs. Thanks These things are easy to create and edit through hex but I might try to add sectors, haven't thought about the others. You need to look at the great work of hdmaster for HD2, if you have not seen it. 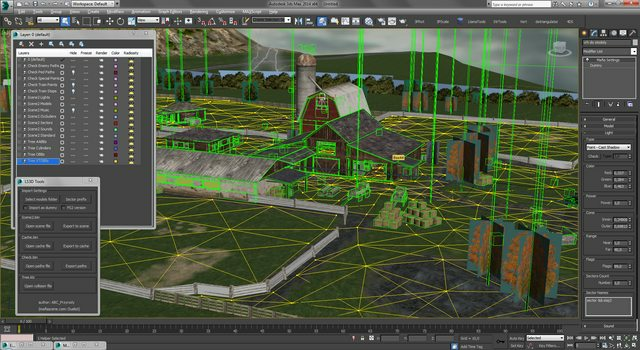 Its promising Global Utility Plug-Ins LS3D Editor can work with 4ds, 5ds, klz, check.bin and scene2.bin files in HD2 format. Also, his work 4DS Tools 2.1 based on Maxscript recognizes (Dummy; Bones; Sectors; Occluder; LODs). Unfortunately, hdmaster froze the development. I thought about it, only imagined a zombie, in like of "half-life" and dismemberment of parts of the body when falling in the animation. The easiest option for this is to replace the model of the class "dog" (the behavior is suitable for creating monsters, zombies and other aggressive animals). Class "dog" has a small number of animations, the change of which will not take much time. I haven't seen the 4DS Tools 2.1 though. I'll check how he did the sectors. You're awesome Duelist. Thank your for what you're doing for the Mafia community. Your work is writing Mafia modding history. Wow! I wish you a truly great success. This is groundbreaking. This is amazing! I remember when people used to say that this was impossible. It shows your strong will that you still tried, and even succeeded! Amazing. I didn't log in for a while and now such a big news. What will be waiting for me next time I pass by? No doubt! Duelist is an amazing modder and helped us come a long way. Thanks guys, it wasn't even hard so I don't know why it hasn't been done before. Here's download link to the character. It still has ugly folds but I could keep on trying to fix it indefinitely and I want to move to adding morphs to exporter already. I'll upload source max file once the scripts are ready for those who would like to fix it further. I look forward to seeing an improved Tommy and Paulie models. Duelist, please check your pm's. Thanks! So it wasn't possible before because of .4ds file format limitations when using z-modeler? Or because other reasons? How the characters models got replaced with the cutscenes one back then years ago? How's the development going? Any news? All we need is just higher poly models and improved facial animations for the main characters.